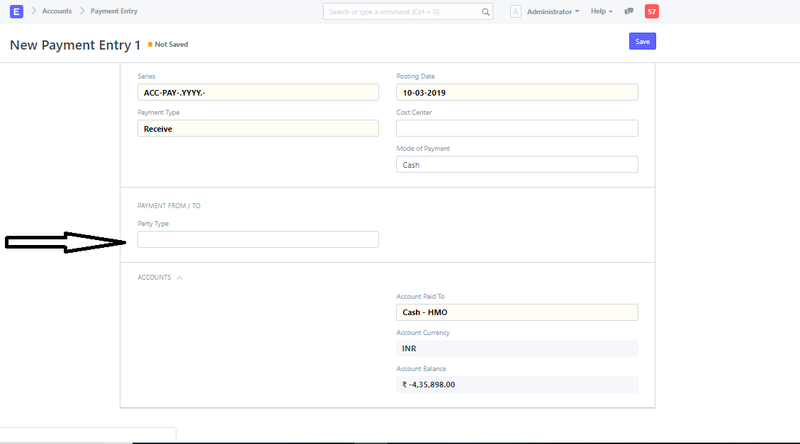 it add a row in accounting entry and place default bank account in account column,looks fine to us. but when we select=>Entry type = cash entry it only add a row in accounting entries. we are expecting that cash in account column. am i missing something ? Is there any other function of using entry type cash? We are using tally in our company , in tally there are different voucher for receive and payment, it looks very convincing to us , we dont have to think about what will goes in debit and what will goes in credit. requesting you add this drop down in journal voucher with entry type cash entry and bank entry . It will help us to switch from Tally to erpnext very easily (actually its a road block to us , most of the time user make mistake with debit credit and put incorrect entry while they do it correctly and easily in tally). Maybe you need a full time certified accountant to handle the debit and credit issue. For a qualified accountant this is never an issue to make a journal entry with credit and debit fields. This is as per the International Accounting practice, So I dont think there will be any changes to this method in new future. Appreciate your request for this feature. hi fardame thanks for your response . we are a small scale company and we dont have trained accountant for data entry May be I am getting it wrong but our Part time UNcertified NONaccountant people are making data entry very easily in tally,but unable to do so in erpnext because of given reason. we are assuming that using this erp we can have less data entry error, more process oriented , all things in software ,and easy to use .Does this ERP is only for full time certified accountant?? Why don’t you use Payment Entry? Journal Entry is geared towards users with accounting knowledge who need to make very specific entries. Payment Entry is abstracted for general users. “Journal entry screen” must be > Accounts >Journal Entry in v11, I guess? Where do you have a select field for a “Journal Entry Type”? we also like to use payment entry but it does not allow us to select the account name in the screen. it asks for party name directly. Is there any work around so that we can select account name in payment screen ? You need to select the party type so the system knows the correct accounts. That’s the abstraction I was suggesting; you only need to know the party you’re transacting with, not the actual accounts. In case of payment entry, account is connected with mode of payment selected, and party type. Payment entry is used only for purchase invoice and sales invoice only. If you want to pass entry which does not have sales or purchase invoice then we only have normal entry. case 1 : we have submitted 100000 cash to bank. case 2: we made mobile recharge and pay internet bill via netbanking from company bank account. case 3:we have buy tea and coffees,pen pencil ,and other small expanses. these type of entries are very frequent ,dont require any authorization , its daily routine work. please suggest how we can do these entries via payment voucher. Do you mean journal entry? we have issues with journal entry voucher , it is very error prone to pass journal entries. Yes, I understood your point of view in your first post. 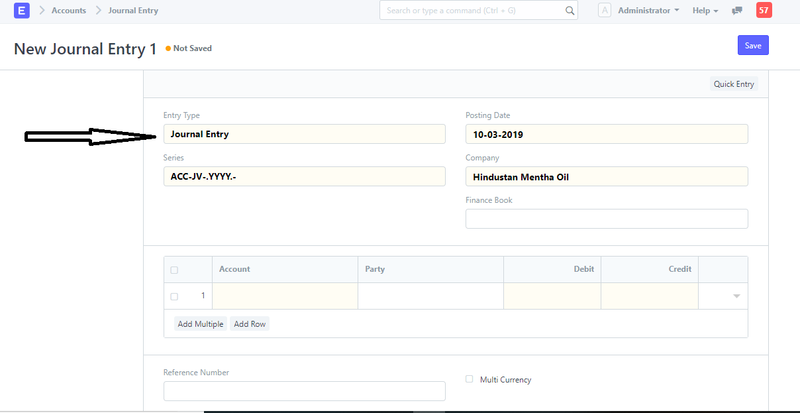 And I also understand that it is much easier and convenient to make accounting journal entry with a pay or receive selection which makes it is for user to understand where to enter the paid amount and where to enter the recieved amount but currently we don’t have that. Debit what comes in and credit what goes out. Hope you understand. Once your user get used to it then there won’t be many confusion. It is just a matter of practice to get used to it. This is not always true for all cases. Paying expenses with payable will cause both expenses and payable to increase. But the increase in expenses is in debit, while payable is in credit. And later when you pay the payable with cash, both will decrease. Payable decrease in debit, and cash in credit. I did check with the tally users regarding your concern quoted able. and I found that ERPNext reacts the same way except for Cash entry, On cash entry it adds a blank row for you. Looks like the default cash account is not defined in the fetch field. If it does then there will be cakewake to train tally operator in to ERPnext .